We have nothing to hide, so we've pulled back the curtain to show it all. Transparent pricing that's clearly communicated allows us to work as a team to design a project that's right for your family, and your budget. While we were a little hesitant at first to put it all out there; now we can't imagine working with our clients in any other way. Seeing the numbers in detail, as we go through the design process, helps our clients to make informed decisions about where they can splurge or where they can cut back the costs. It all starts with the presentation of a Forecast Budget early on in the design process. This first step ensures we are on track with the desired budget range. The Forecast Budget is honed as we refine the design. 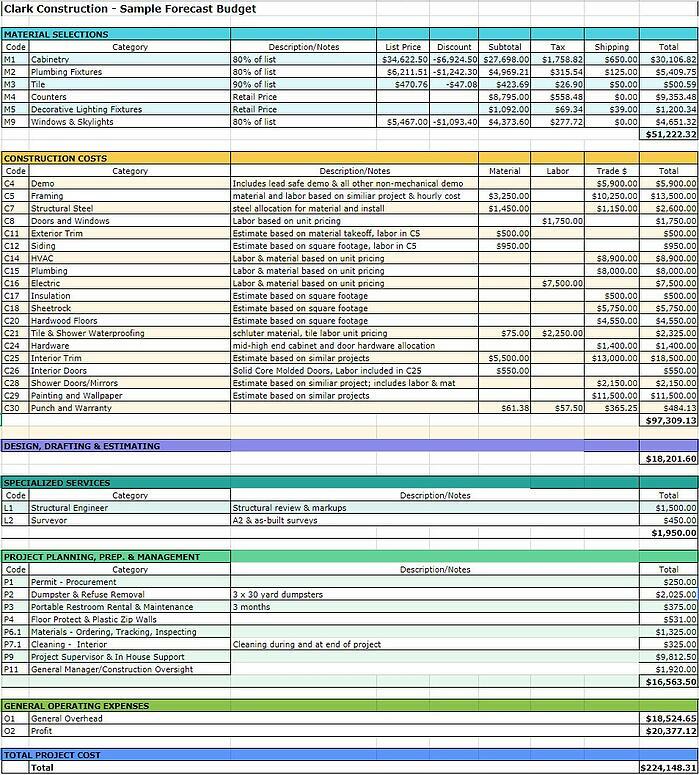 Once we have the project fully detailed we present a line itemed estimate, in the same format as the Forecast Budget. Having all this information on the table from start to finish has done away with any sticker shock surprises, over runs from an over-embellished design, or any sense of discomfort about if you're being charged fairly. It also gives you the ability to make informed decisions along the way, knowing how these decisions will impact the overall project price. Everything seems simpler now that we have eliminated the mystery of what might be in the black box behind a "package price". We even break out the design time. We develop design objectives up front, along with a design time budget. We estimate how much time will be needed for each design phase. At the start you provide a retainer, then we charge for the actual design time, and then credit this money to the construction project. The time is tracked and reviewed with you at each meeting. Charging for design time allows us to properly cover our costs so we can work together with you, as a team, rather than trying to rush to get to a contract signing. We are able to spend as much time as makes sense designing with you to ensure that you have a thorough understanding of the design and all the details. Additionally, we will send you home with copies of the drawings, allowing you to think about the design as you sit in the space, and provide feedback at each step along the way. This really helps to ensure that what is being put on the drawings is what you want and that you have time to understand the drawings. Some clients make very quick decisions and fly through the design process; charging hourly for our time gives us the flexibility to go at whatever pace feels comfortable to you. 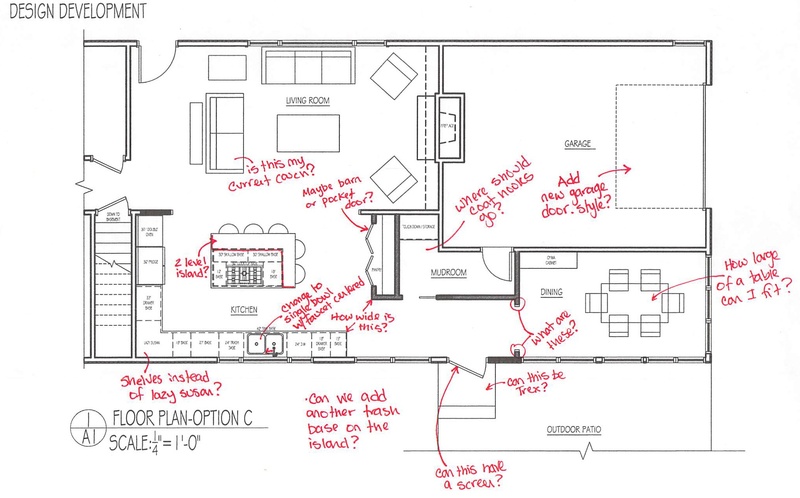 One client came in and in one meeting they finalized the design and made all the selections for their bathroom project. Another client was happy to spend the time to change their bathroom fixtures four times as their tastes and the design evolved from a simple hall bath replacement to an eye catching guest bath. One client had us make life sized drawings of the kitchen drawers so that we could optimize the size of the stiles and rails and panels. For many clients a simple 3D model is developed so they can get the feel for the new space before "pulling the trigger". With this design process we can ensure that the project includes what you want, that you you understand exactly what you'll be getting. 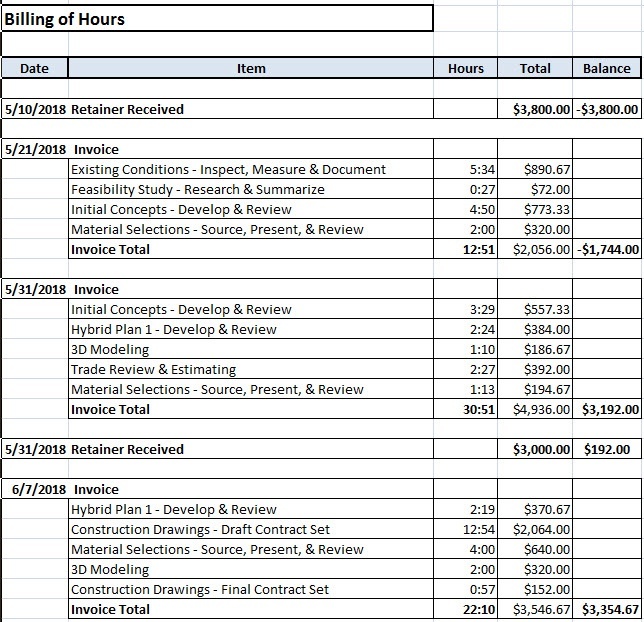 Clark Construction Forecast and Contract budgets include three types of line items that most other companies avoid like the plague: bare trade contractor bids, supervisory time, and business expenses (overhead and profit). Starting with the Forecast Budget, you get to see the actual costs for the trades and materials. Clients seem relieved by the fact that they can see our tradespeople's bids, and often times, if they have previously priced a particular trade, can see that the numbers we have provided on our breakout make sense; this is a great confidence builder. We are your advocates with the tradespeople. We know where the pricing should be so we will negotiate on your behalf and if we can use another one of our trade partners to get a better price we will do so. A portion of labor cost on any remodeling job is time spent coordinating with and supervising other people. Planning and project management tasks are listed as direct costs rather than being swept into overhead and covered by a large markup. The idea is to account for all costs that are specifically related to a particular job, rather than using the same fixed markup on all jobs to cover these activities. Activities in this category include items such as site prep, ordering materials, scheduling deliveries, waiting for inspections, client meetings, job documentation, and trade contractor supervision. Itemizing out these items makes for a more customized and therefore more accurate estimate, and gives clients a clearer picture of how their budget will be spent. As with tradespeople prices, these numbers are adjusted up or down if and when the scope of work changes. For a lot of remodelers, the elephant is still in the room. For us, general overhead and profit, the last two line items on the estimate, are out there in plain sight to be acknowledged, explained and justified. Being able to share these numbers is refreshing. When you know what you are getting for your money, you can be more comfortable with the numbers. It allows us to work together with you to make value based decisions to optimize your remodeling budget and investment - so that you end up with a beautiful project, and one that makes sense dollarwise!